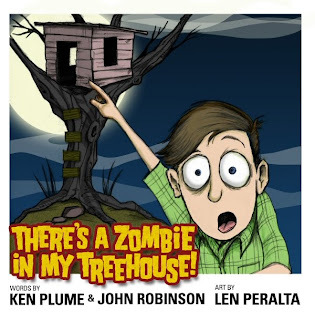 I was checking back on the archives of this blog and was shocked to see that I never wrote up a proper post for "There's A Zombie In My Treehouse" the book I did with Ken Plume of QuickStop Entertainment and John "Widge" Robinson of Needcoffee. I blame the fact that the book was released in the midst of our move/house sale/vacation/housewarming party/school phase of the year. So blogging had to take a back seat. I know I had twittered about the book, so in my mind, I had blogged about it - micro-blogged at least. But sometimes things need more than 140 characters of chat. This is one of them. The book is a labour of love that started in the summer of 08. I received a call from Ken, who received my name via Paul of Paul and Storm. He and John were looking for an illustrator on their book project and had had little success engaging an artist. Me, being the no one artist I am, heard the words "zombie, kids book" and "illustrate" and I jumped right on the chance. I didn't know exactly what I was signing up for, but I knew it sounded cool enough to give it a shot. Make no mistake, it was tough work. Hours of illustration, character sketches, conversations, revisions, layout changes, more layout changes and even more revisions and layout changes. But in the end, I feel the book is exactly the way I envisioned it would be. Wonderful black and white pencil art with a hint of odd and creepy permeating the story, penned wonderfully by Ken and John. As the Brits (and Ken) would say, bloody brilliant. On podcast episode 251, I chat about meeting former Python and film director, Terry Gilliam. The biggest compliment I have ever received was about the art in the book. Terry Gilliam, a man I respect for his artistic vision and a person who has been so influential in the kind of art that I do, said he loved the art. He loved it. If that's not a testimonial you can abide by, then this book is not for you. If it is, then I highly recommend you check out the book for yourself and add it to your collection. And I'm not saying this only because I drew the pictures for it. I'm saying it because the book is full of the kind of awesomeness that I hope to continue offering throughout the rest of my career and life. In the coming weeks, I will have actual physical copies of the book for sale that you can purchase from me personally. I will even sign it, if you are into that sort of thing. You can also pick up the book online here. And if you come to Cleveland or if you and I are one day at the same place at the same time, I can sign it then. Or pose for a picture with you and the book. Whatever tickles your fancy. Needless to say, I highly recommend the book. And if you don't pick it up, then you're not a real fan of our show then, are you? Signed copies of the book (by both authors Ken Plume and John Robinson and myself) are now available to be purchased directly from me. Just click below! Shipping and handling is included in the price. My New Art Site: FlipFace!